The Rev. Teikichi Sunamoto was born September 30, 1857, at Koi, Hiroshima. When sixteen years old he applied for enlistment in the navy, and served on gunboats until 1880. In October of that year, he sailed as second mate in a merchant vessel to San Francisco. His purpose was to get an education and support his mother. In San Francisco he became a faithful attendant at the preaching services of the Gospel Society. On May 7, 1881, he was baptized by Dr. Otis Gibson. Mr. Sunamoto worked for the Gospel Society until August 1886 when he returned to Japan with the one purpose of leading his mother to Christ. He went to Kobe and presented a letter of introduction from Dr. McClay, of Tokyo to Dr. J.W. Lambuth [a missionary]. Then he went on to his home in Hiroshima and was warmly welcomed by his family. Shortly after this Dr. Lambuth went to Hiroshima and held quiet meetings in his hotel. 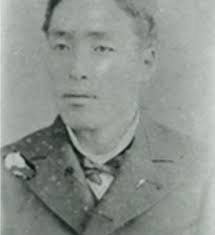 In February 1887, Mr. Sunamoto’s mother and eleven others were baptized; among these were M. Matsumoto, G. Ota, and K. Mito, all three of whom became prominent preachers. The first chapel, located on Daiku Machi, was used also for a girls’ school with forty students enrolled in 1887 and conducted by Mr. Sunamoto. Miss N. B. Gaines became the principal of this school, and under her leadership the present Hiroshima Girls’ School was developed. Mr. Sunamoto was married to Miss Watanabe, August 8, 1887. For three years Mr. Sunamoto constantly itinerated with Drs. J. W. and W. R. Lambuth [later bishop] and Dr. O. A. Dukes, aiding in opening work in Tadotsu, Iwakuni, Yanai, Hirao, Shobara, Uwajima, Yawatahama, Oita, Matsuyama, and Himeji. Then he was abroad again until 1894 engaged in Christian work in Hawaii and San Francisco. Returning to Japan, he became pastor of the Kojiya Machi Methodist Church in Nagasaki under the Methodist Episcopal Mission. After six years there and having made that church self-supporting, in August, 1900, he returned to the Southern Methodist Mission, and from that time until he was superannuated in 1927, he did successful work as pastor in Iwakuni, Mitajiri, Kure, Shimonoseki, and Oishi. Even since his retirement he has continued to travel and in many ways to encourage pastors, missionaries, and other workers and to win souls. comfort those in distress, and point the way to heaven. He initiated a movement for the erection of a memorial church to Bishop Lambuth and has raised nearly 12,000 yen for this important enterprise. In his eightieth year he was still going in and out among us, radiating faith and a holy influence over all. At the recent celebration of the fiftieth anniversary of the Hiroshima Girls’ School, the school faculty, students, and assembled guests took delight in honoring the aged founder, and now well on to his eighty-first our friend lays down his armor and passes to his rich reward. From World Outlook, Volume XXVIII, No. 8, August 1938, p. 8. By S.E. Hager. S.E Hager is a missionary in Japan.